The member organisations that comprise BCCIC are diversely engaged in the many aspects of sustainable development, but share a common directive. That is, members constitute organisations, groups, and individuals based in British Columbia who support projects overseas and/or promote an understanding of global citizenship through related work within the province. The Council’s members are all working towards a common purpose: To achieve a more equitable world through their involvement in overseas projects, global education and/or public awareness in British Columbia. Given the shared mandate of BCCIC and its member organisations, the Council is currently focusing on the Sustainable Development Goals (SDGs): a framework of 17 interconnected goals that aim to address the world’s environmental, social, economic, and security challenges. Unprecedented in nature, these new goals seek to build upon the successes of the MDGs while going further, as indicated by the goals’ universal and aspirational approach. The SDGs are outlined in the 2030 Agenda for Sustainable Development (Agenda 2030), which entered into force in 2016 and will carry the world through 2030. 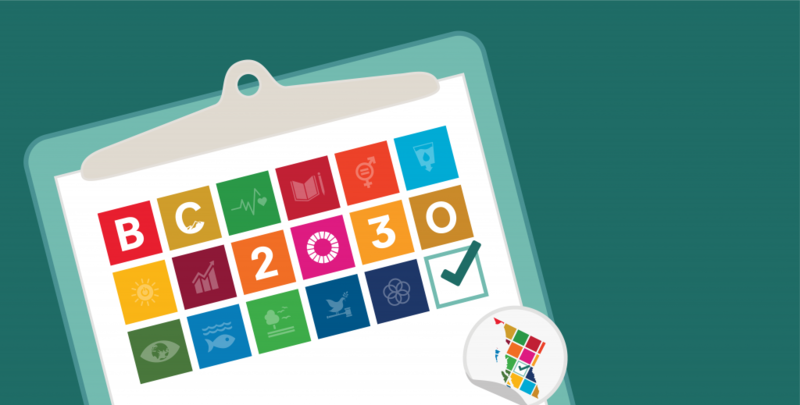 BC 2030 seeks to make the SDGs a common issue throughout the provincial election with all party candidates, media, and stakeholders engaging in the discourse and putting forward strategies and commitments towards establishing BC as a leader in realising the SDGs. To this end, this non-partisan initiative is employing the SDGs and Agenda 2030 as a common framework for all civil society groups lobbying and campaigning throughout the provincial elections so that specific sector issues are continuously framed and communicated to politicians and the public through the lens of the SDGs. A successful BC 2030 initiative will be evidenced by: party representatives approaching BCCIC and its members for information and/or guidance around the SDGs; the SDGs and Agenda 2030 being frequently referenced in election campaigns and in the media; provincial candidates framing their policy agendas in reference to the SDGs and Agenda 2030; and the distribution and use of this election toolkit. This election toolkit is intended to help facilitate individuals’ and organisations’ engagement with the candidates before, during, and after the official 2017 electoral campaign. The toolkit will help in conducting non-partisan advocacy for BC 2030 by providing guides for the provincial election, various tools for engaging candidates, and messaging templates. While some components of this toolkit – such as the guidelines for conducting non-partisan advocacy – should be closely adhered to, others – such as the messaging templates – are mere suggestions to help get you started as well as encourage consistency throughout the initiative. > How did we get here?